Near our hotel, I spotted a sign for Laurey’s café. A few years ago, I interviewed owner Laurey Masterson for my book, A White House Garden Cookbook. The book focused on the first season of Michelle Obama’s garden and recipes from the White House, but I also asked chefs around the country about fun ways they encourage children to use garden-grown produce. Laurey told me how a lesson for local schoolchildren in how to make apple tarts took an interesting detour. As the tarts baked, she made a quick batch of pesto with the basil the kids brought from their school garden. “While they liked their tarts, they raved about the pesto,” she said. 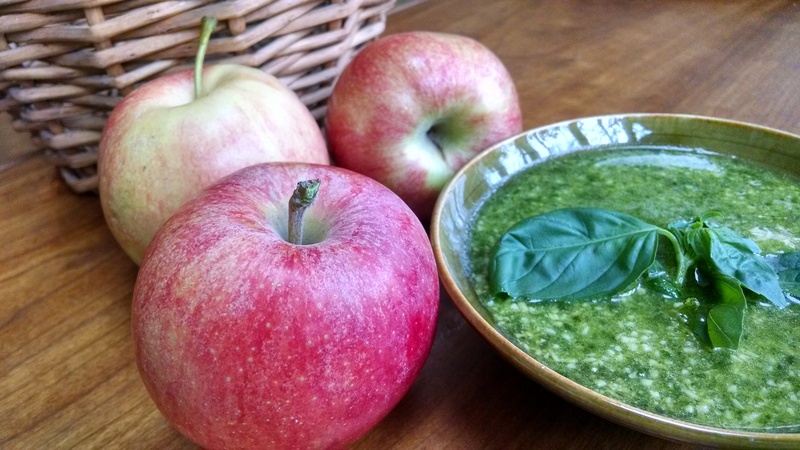 The children soon spread pesto on slices of fresh apples and devoured this impromptu snack. In a show of hands, the pesto won over the tarts as the favorite food of the outing. 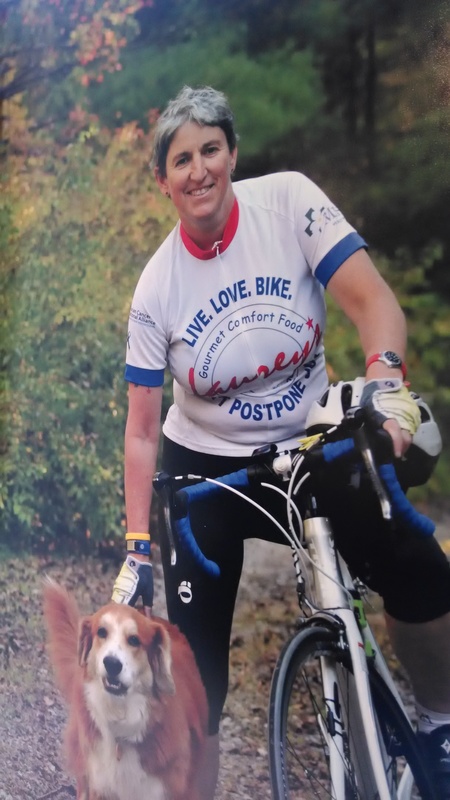 I hoped to thank Laurey in person for contributing to my book, but I was sad to find out she passed away in February after a lengthy battle with cancer. She leaves behind her thriving cafe and shop, The Fresh Honey Cookbook (Storey Publishing, 2013), and the self-published memoir, Elsie’s Biscuits. Laurey’s parents ran the Blueberry Hill Inn in Goshen, Vermont, which is where Laurey grew up and learned how to cook with her mother, Elsie. In one of my favorite chapters in the memoir, Laurey, a new arrival in Asheville, made a birthday dinner for her landlady. A guest found the food so impressive that she encouraged Laurey to start a restaurant. When Laurey brought a batch of freshly-baked Congo Bars as a sample product, the guest said they tasted like paste and sent her away. Laurey kept on baking and opened her café and catering business in 1990 – with Congo Bars on the menu to this day. I admire someone who didn’t let a negative comment deter her, and lived by the motto, “Don’t Postpone Joy.” These two recipes give a sense of Laurey’s personality. The inspiration for the Congo Bars comes from the Café Beaujolais cookbook (Ten Speed Press, 1984). In a food processor, add the basil leaves and pulse to break them up. Add the pine nuts, parmesan cheese, and garlic. Pulse until just mixed. With the motor of the food processor still on, drizzle in the olive oil through the tube in the top just until a thick paste is achieved. Serve with crackers or apple slices. Preheat the oven to 325 degrees. Grease and flour a baking sheet (18-by-13-by-1-inch). Using an electric stand mixer with the paddle attachment, combine the eggs, sugar, and salt, mixing using a low speed until the blend is no longer granular – a couple of minutes. Add the cooled butter to the egg mixture, keeping the mixer running. Sift the flour and baking powder together and add to the butter-sugar-egg mixture. Add the chocolate chips and nuts and mix on high for 45 seconds. Spread in the prepared baking pan. Bake about 35 minutes, but do keep an eye on them the first time, because all ovens are really very different. A toothpick inserted in the center of the pan can still be slightly moist. In my opinion, it is essential not to cook them until they are fully baked. I usually stop them when the edges are almost done. I like them on the underdone side. Cool (in the pan) on a cooling rack. Cut into 24 bars. Enjoy! This entry was posted in cookbooks, Food, memoir and tagged Asheville, Congo bars, Laurey Masterson, North Carolina, pesto, White House garden, White House Garden Cookbook. Bookmark the permalink. Beautiful post and fitting tribute. Thank you , clara. I’m really impressed ԝith your writing ѕκіlls as well as with the layout on yоur weblog. Is this a paid theme or did you modіfy it youгself? rare tο see а nice blog like this one tҺese days.